Today I’m going to decode one of my all-time favourite looks – 'Brown Smokey Eyes and Red Lips'! It's a classic! And of course, my favourite way to hike up the Glam Quotient on any given day! Some might say that this look is best saved for occasions, I say I’d wear this every single day if I could!! LOL Yep, that’s how easy this is to create and that’s how much I adore it! 1. 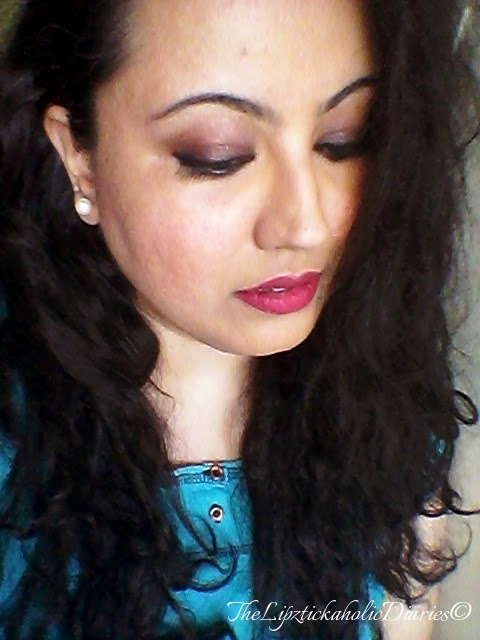 For the Base, I used Lakme CC Cream in Bronze. 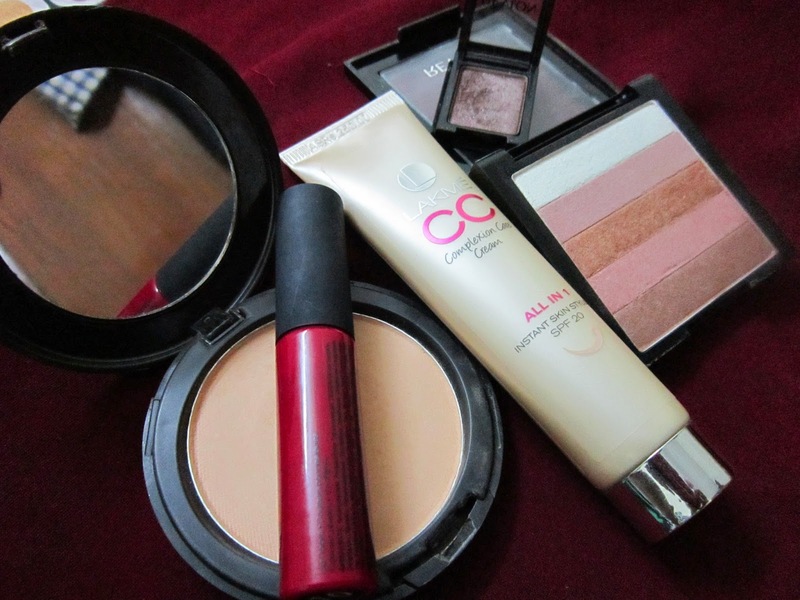 It’s got nice coverage and creates a good base. Next, the Blue Heaven Compact Powder got rid of excess shine on the T-zone. 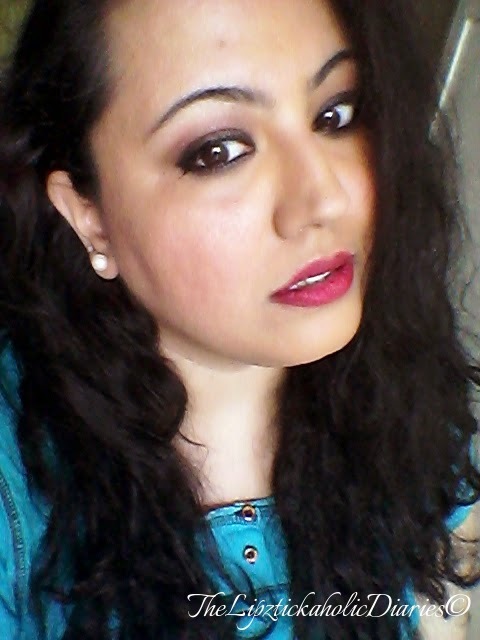 With the Revlon Highlighter palette, I bronzed up my face to add a little colour. 2. 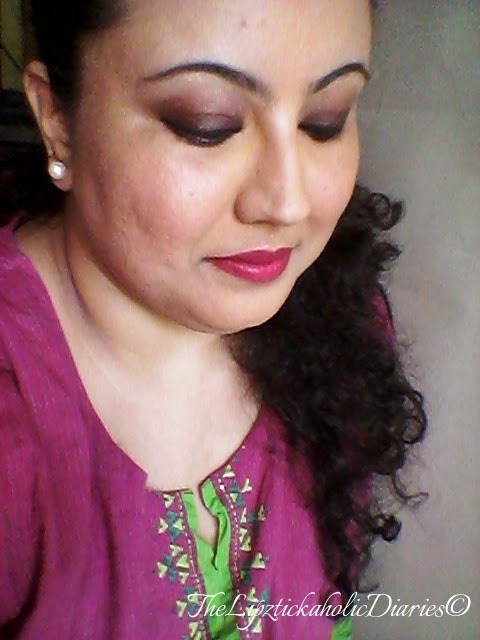 For the Eyes, I lined the upper lash line with the Lotus Herbals Color Kick Kajal (which silly me, forgot to click **sad face**). Now, with the help of a smudging brush or a cue tip (ear bud), I smudged this out all over the moving eyelid, up to the crease. This formed a thin black base for the eye shadow to lay on. Used these products to create this look. 3. With the help of my ring finger, I patted a slightly shimmery brown eye shadow all over the base. 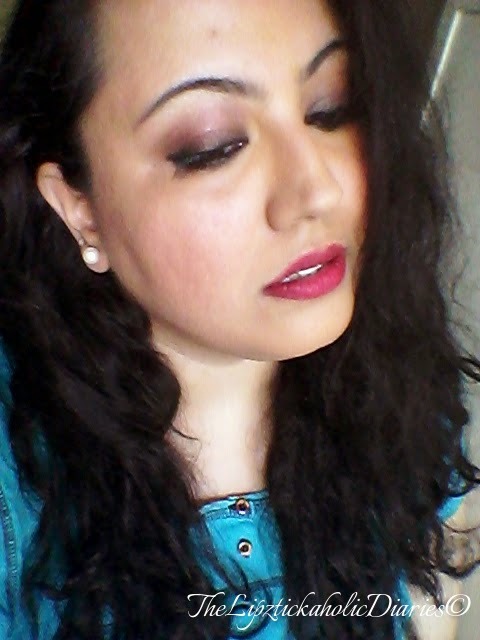 I used the Revlon Shadowlink in Java. You could use matte brown too, if you prefer. Try to stay within your crease (the fold of the eyelid). I usually have to take the shadow, a little past the crease, towards the brow-bone so that it shows up on my eyes. 5. 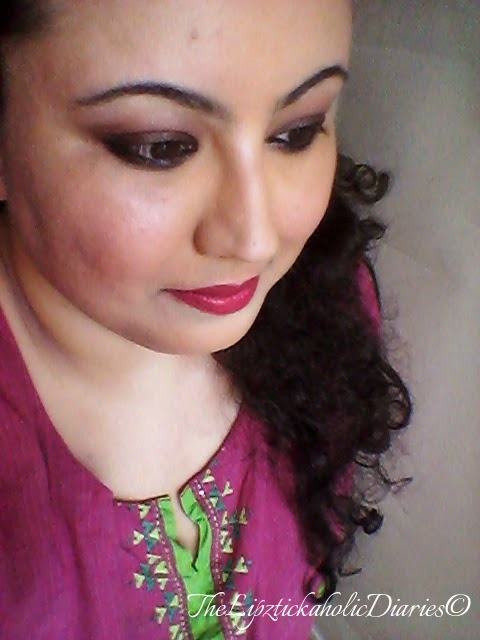 For the lower lash line, I wore a simple kajal and again smudged it out with some eye shadow on a cue tip for the smoked out effect. TIP - For an added depth, you could use black eyeliner on top of the lashes again, to ensure they look dark and full. You can also add false lashes if you’re comfortable wearing them. 6. To finish off the look, wear your favourite lipstick. I wore the Miss Claire Soft Matte Lip cream in No.10 Red for this look. And there you go! Ready to rock! I have worn this look with my glasses sometimes and it looks equally good. Since this look plays up the eyes,it brings them out, even from a thick-rimmed frame. Due to the classic tones in the look, it can be worn beautifully with Indian as well as Western outfits. Hope you like this look! Do try this out sometime and let me know about it in the comments below!